When given a folder (You can add multiple folders too) to NoClone, it scans all the files within that folder and the sub folders. It then compares all the files against one another and gives you the files that are exactly similar to each other. 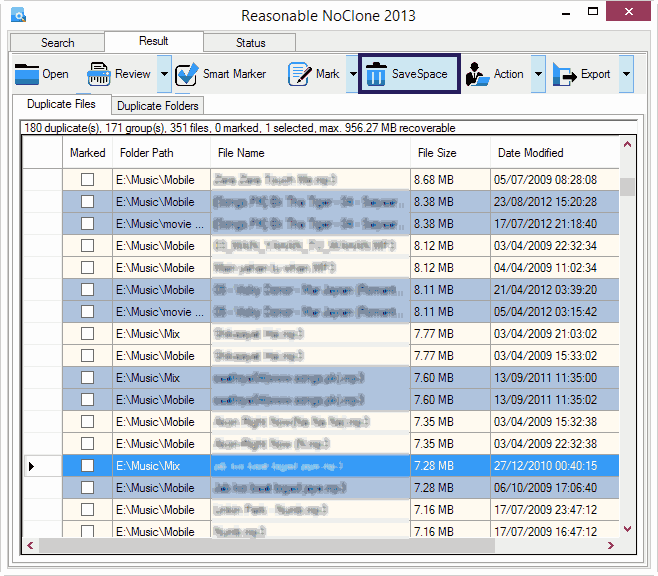 It lists the duplicate files along with their name, location, size and the modified date. You can mark the files that you want to remove and leave out the rest. After selecting all the files, you need to click the “Save Space” button in the top navigation. Though the free version has some limitations, for an average PC user the free version will suffice. One more thing that can irritate you is the countless prompts to buy the applications. But the application is very powerful and the features it provide can really make it very easy to manage your media collection. And don’t forget the free space you will get after you remove duplicate files.